Frequently, the frameless glass partitions are used, when people want to divide area into two rooms. For example, kitchen from the living room, bathroom from shower, work room from the other room etc. 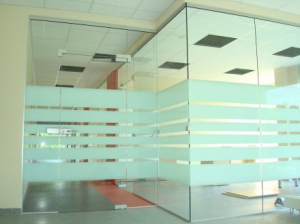 Recently, it is very popular to use hardened glass partitions. This is not only in the living space, but also in medical institutions, banks, administrational buildings or offices. Frameless glass wall panels are made of sheet of glass, attaching them to top and bottom (sometimes side wall as well) aluminium rails. You can pick from different types of glass, speaking about the glass panel. Particularly frosted/matted glass type is the best option for the offices, banks and industrial buildings – no one can see through. Despite that, matted/frosted lines with engraving technology is often preferred. For a private space our recommendation goes to a glass wall with tinted glass. Furthermore, a standard opening door or a sliding door system can be mounted. Besides, if the opening glass door is impossible to mount, because of the space limit, then option with a sliding door works perfect. 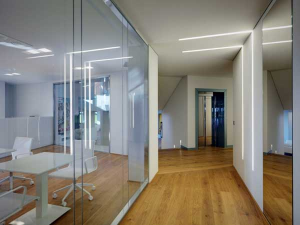 The wall of the glass optically increases the space, looks modern, clean and is safe. If You have a simple plan or an architectural drawing, just share it with us and our team will make a sketch, solution and price calculation.